Are you looking for help with a dental concern that just didn’t fit into any of the previous sections? 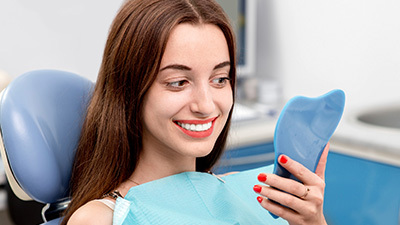 Don’t worry – 21st Century Dental covers all the bases with our extensive variety of advanced services, from quality restorative solutions for treating injured/decayed teeth to focused therapy for chronic jaw pain and headaches. Our goal is to leave you happier, healthier, and ready to smile by the end of your appointment here in Las Colinas, TX. Keep reading below, and don’t hesitate to call if you’d like to schedule an appointment with our dedicated dentists. Why Choose 21st Century Dental for Advanced Dental Procedures? When a tooth has suffered a traumatic injury. When a patient has advanced periodontal (gum) disease. When a tooth is suffering from significant tooth decay. 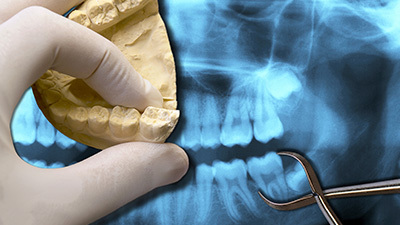 When a patient is in need of orthodontics and one or more teeth must be removed to accommodate the treatment plan. If your situation is a match for any of the ones above, rest assured that our team will not only help you feel fully comfortable throughout the procedure, but that we’ll also start working with you right away on an attractive and reliable replacement. We don’t want anyone to have to spend too much time without a complete smile! 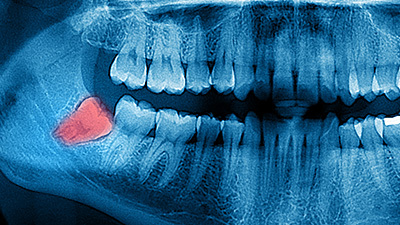 Wisdom teeth are the most frequently extracted teeth. Due to their late eruption, they often create oral health issues like impaction, crowding, and shifting teeth out of alignment. To prevent these issues, we may encourage patients to undergo wisdom tooth extraction to protect their smiles. When you have a tooth needing repair that requires more than a tooth-colored filling, a dental crown may be the solution. In the case of a broken or deeply cracked tooth, a crown restores both form and function. 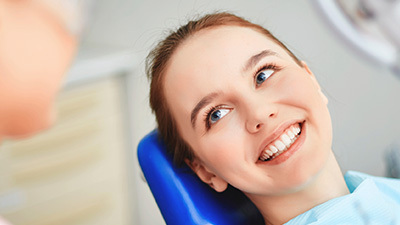 Placing a dental crown requires scheduling two appointments with your dentist in Las Colinas. At the first, a minimal amount of tooth structure is removed to make room for the crown to fit evenly between adjacent and opposing teeth. 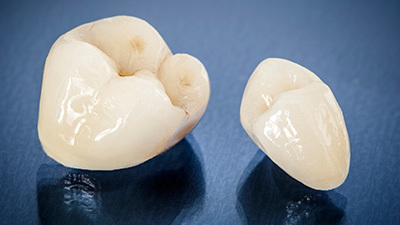 At a follow-up visit two weeks later, the dental crown is permanently bonded in place. 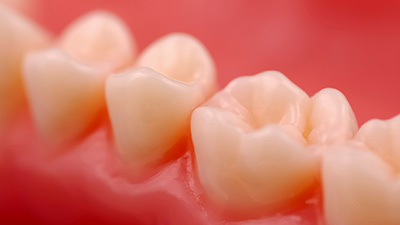 Dental crowns can also be used to secure a fixed dental bridge. In this case, crowns are mounted on healthy teeth that are on either side of a missing tooth. The crowns and bridge are constructed as a single unit. Once the crowns are placed, the false teeth in between are suspended across the gap and your smile is complete again. Dental decay is probably the most common problem we see. There are millions of bacteria living in your mouth, and every time you eat, they are ready and waiting to feast on small particles of food that are left behind on your teeth. If not cleaned away with brushing, the acids they excrete can lead to cavities. When that happens, we can place a tooth-colored filling. 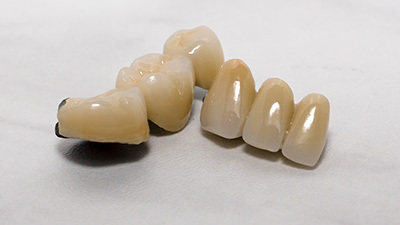 Made of composite resin, which is comprised of medical grade plastic and ground glass, these fillings blend in with the natural color of your tooth and are as strong as their metal counterparts. 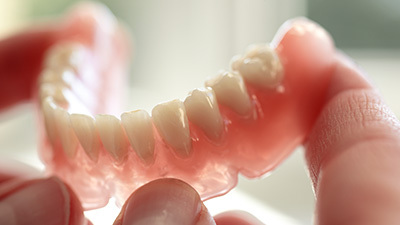 For people who are edentulous, custom-made dentures are available. These have long been used to create a smile that is full and functional. 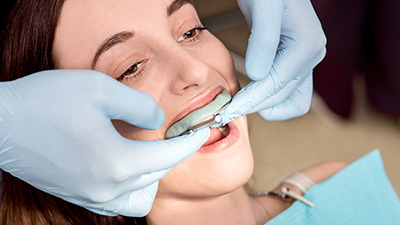 Our dentists take precise measurements of your mouth in order to design dentures that look natural and fit comfortably. Resting on your gum ridge, dentures are held in place with a combination of natural suction and denture adhesive. While other practices often refer these cases to specialists, our Las Colinas dental team is happy to complete most root canals in our welcoming dentist’s office that you’re already familiar with. These treatments have a reputation for being painful, but root canals should actually significantly relieve toothaches and dental sensitivity. Using NTI-TSS (Nociceptive Trigeminal Inhibition Tension Suppression System), we may be able to reduce the frequency and/or severity of headaches for many patients. Patients who clench or grind their teeth are much more likely to suffer from chronic headaches and migraines. The NTI-TSS uses a custom oral appliance to prevent the movements of the jaw that lead to headaches. These appliances also protect teeth from excessive dental wear that occurs due to chronic teeth grinding and clenching that is referred to as bruxism.